When it comes to building speedy and cost-effective housing, it’s hard to beat prefabrication. That’s the route Spanish architect Marc Mogas took when creating the Font Rubi Cottage, a modular summer home built on a budget. 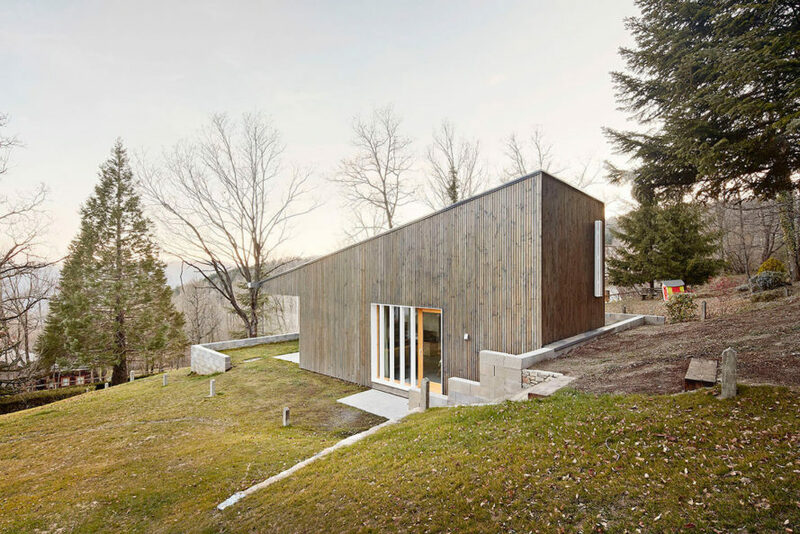 Located on a wooded slope in Spain’s Pyrenees Mountains, the small cottage minimizes its impact thanks to careful site placement, prefab design, and the use of reinforced concrete retaining walls for the base. Mostly constructed from timber, the 100-square-meter Font Rubi Cottage is carefully placed on a narrow and steeply sloped site to preserve as many of the existing trees as possible. To mitigate the slope’s 14-meter level difference but minimize site impact, the architects excavated part of the terrain to embed the house between the trees and reused the earth to create terraces. Concrete retaining walls installed on the excavated area serve as the base for the timber modules. The Font Rubi Cottage is split into three modules: one unit for the master suite and three bedrooms, a second unit for the living room and kitchen, and the third for the roofspace mezzanine. 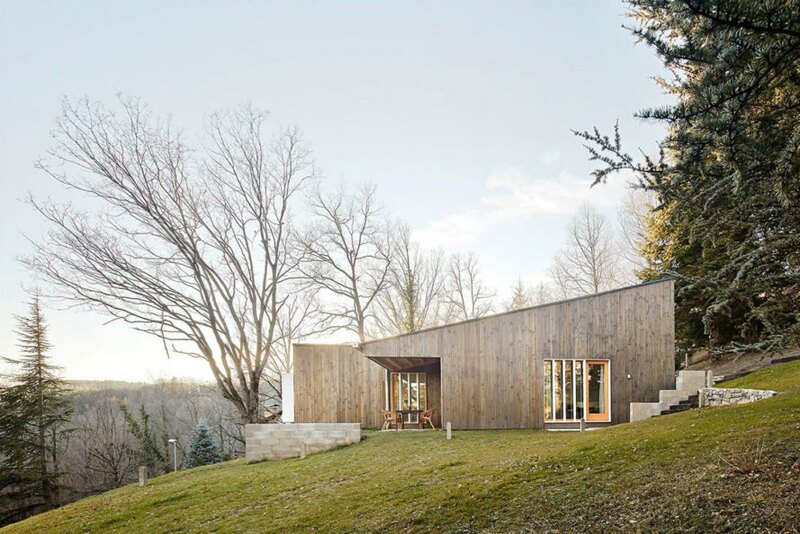 The pine-clad walls are insulated with rock wool and punctuated with white steel-framed windows and doors. 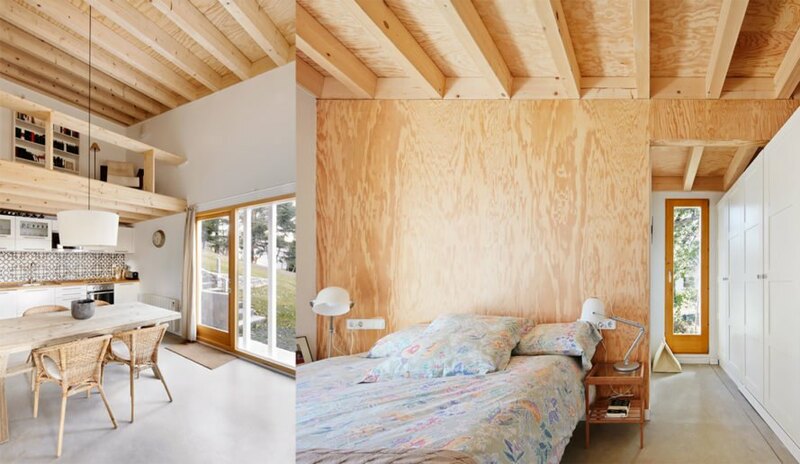 The pine construction is left exposed in the interior, while the interior walls are painted white. The prefabrication process and minimal on-site construction helped keep the project within a budget of €100,000. When it comes to building speedy and cost-effective housing, it’s hard to beat prefabrication. That’s the route Spanish architect Marc Mogas took when creating the Font Rubi Cottage, a modular summer home built on a budget. 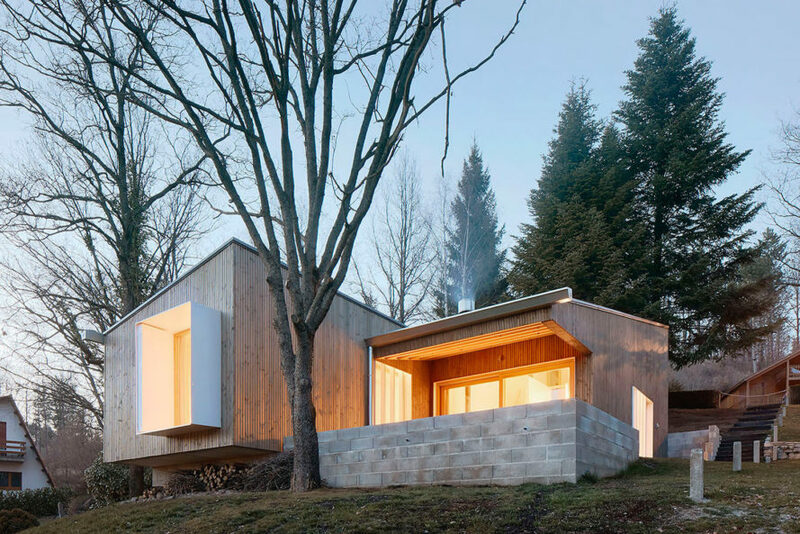 Located on a wooded slope in Spain’s Pyrenees Mountains, the small cottage minimizes its site impact thanks to prefabrication, careful site placement, and use of reinforced concrete retaining walls for the base. Mostly constructed from timber, the 100-square-meter Font Rubi Cottage is carefully placed on a narrow and steeply sloped site to preserve as many of the existing trees as possible. To mitigate the slope’s 14-meter level difference but minimize site impact, the architects excavated part of the terrain to embed the house between the trees and reused the earth to create terraces. Concrete retaining walls installed on the excavated area serve as the base for the timber modules. The Font Rubi Cottage is split into three modules: one unit for the master suite and three bedrooms, a second unit for the living room and kitchen, and the third for the roofspace mezzanine. The pine-clad walls are insulated with rock wool and punctuated with white steel-framed windows and doors. 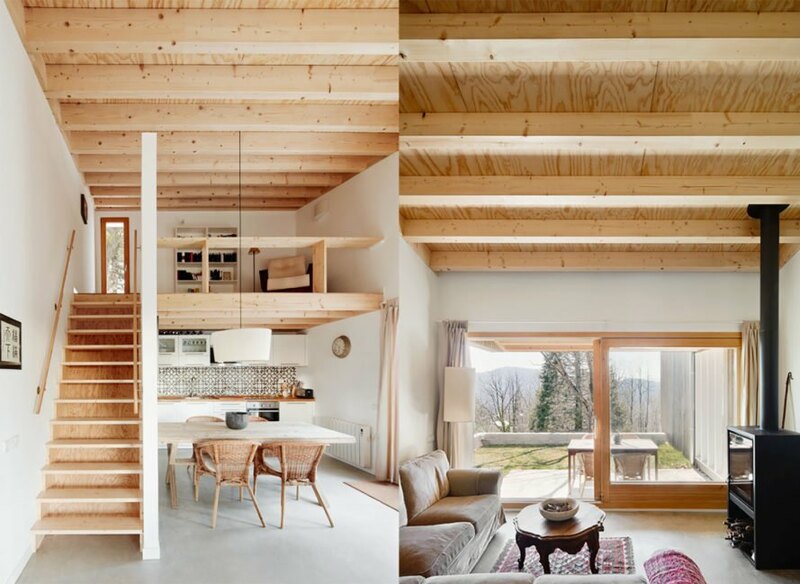 The pine construction is left exposed in the interior, while the interior walls are painted white. The prefabrication process and minimal on-site construction helped keep the project within a budget of €100,000.